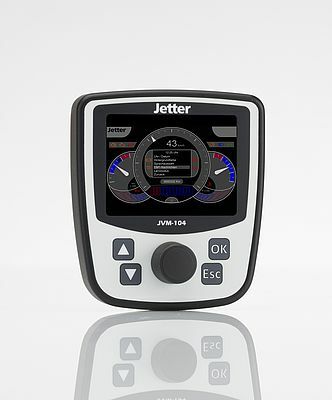 The JVM-104 is a new HMI by Jetter with ergonomic design. Its 3.5" TFT display with LED backlight is installed in a rugged plastic enclosure. This compact HMI is best designed for both day and night use due to the backlit keys and the light sensor, which automatically adapts the illumination of the display to the brightness of the surroundings. The device is equipped with four function keys and is available with an optional DigiPot. The enclosure complies with the degree of protection IP65. The operating temperature ranges from -20 to +65 °C. Thus, it can be used for outdoor applications. The HMI runs Windows CE as its operating system. Thanks to its integrated controller it is best apt for cost-sensitive applications. Peripheral devices can be controlled via CAN bus. Two multi-purpose inputs and four PWM outputs are available as options. The device can be equipped with an optional USB and Ethernet port. Typical areas of application include automated construction and agricultural machinery, but also traditional industrial automation.